This cool looking Hans Solo Door is actually very easy to create using a Life Sized Wall Decal. 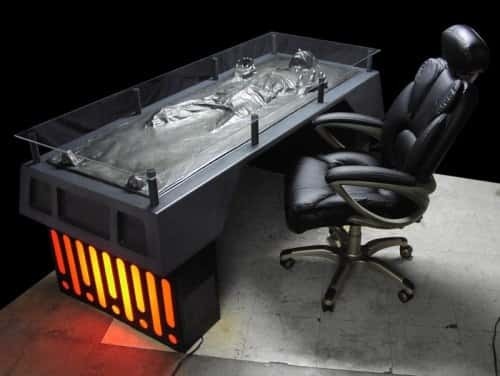 A very impressive decorating idea that is sure to enhance any Star Wars themed room. The Hans Solo in Carbonite decal is removable and you can relocate it without damaging any doors or walls. This is also an excellent idea for the door of a home theatre or a hidden bookcase. I have included a video that shows you how one Star Wars fan built a very neat bookcase that swivels to reveal the entrance to a home theatre, interesting stuff! This cool decal can be used for more than just decorating a door or a wall. There are lots of great ideas that have been tried and if you use your imagination you can very likely think of your own. 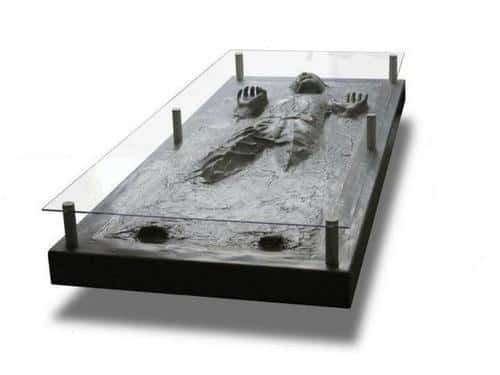 You could use it to create an interesting desk or coffee table or give it as a gift to your favorite Star Wars fan! This amazing sticker/decal appears to be three dimensional but in fact it is not. It is flat and can be applied to almost any flat surface. If you are looking for some cool Star Wars themed stuff be sure to check these out as well ... R2-D2 USB car charger, Death Star Ice Tray, Star Wars Keyboard.